Habit: Tree. Stem: < 40 m; young bark smooth, pale yellow-green to gray; older bark furrowed, brown to gray; twigs with swellings below leaf scars; winter bud generally resinous, scales > 3. Leaf: juvenile, adult, late-season leaves may differ in size, shape, hairiness; generally glabrous; blade 3--11 cm, elliptic to deltate, veins pinnate or +- palmate, tip generally elongate. Inflorescence: catkin pendent, 3--8 cm; bract cut into narrow segments; flowers sessile; nectary a cup- or saucer-like disk. Flower: perianth modified into non-nectariferous, cup- or saucer-shaped structure. Staminate Flower: stamens 8--60. Pistillate Flower: style short, stigmas 2--3(4), large, scalloped to 2-lobed. Fruit: spheric to conic; valves 2--3(4), 3--12 mm. Habit: Tree < 20 m; crown wide. Stem: twigs yellow, gray in age, glabrous to hairy; winter buds resinous. Leaf: petiole 1/2 to = blade, laterally compressed; blade 3--7 cm, deltate, yellow-green, glabrous to hairy, often stained with milky resin, base +- cordate to truncate, tip +- tapered, margin coarsely scalloped. Ecology: Scattered. Alluvial bottomland, streamsides; Elevation: < 2000 m. Bioregional Distribution: CA (exc MP); Distribution Outside California: to central Rocky Mountains, northern Mexico. Flowering Time: Mar--Apr Note: Hybrids with Populus trichocarpa (Populus ×parryi) reported from California. Synonyms: Populus deltoides Bartram ex Marshall var. 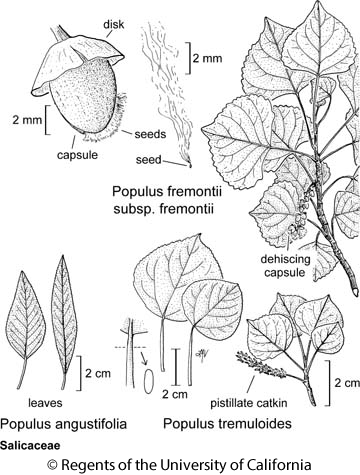 fremontii (S. Watson) Cronquist; Populus fremontii var. arizonica (Sarg.) Jeps. ; Populus fremontii var. macdougalii (Rose) Jeps. Citation for this treatment: John O. Sawyer, Jr. 2012, Populus fremontii subsp. fremontii, in Jepson Flora Project (eds.) Jepson eFlora, http://ucjeps.berkeley.edu/eflora/eflora_display.php?tid=52463, accessed on April 19, 2019.